Nothing about puffins is ordinary. Here is one coming in to land not five yards from where I stand on the Isle of May. I’m standing still, but even so, I’m six feet tall and not at all rock-like. It seems hell-bent on landing there anyway. It comes at me head-on, and in its final gesture just before touchdown it throws its wings wide – if you have never seen a puffin up close, they are surprisingly small – with a pronounced upwards curve. In this attitude, its head appears to have slipped below the level of its shoulders. The effect is of a vivid white owlish face ringed by a black collar. The whole is rakishly divided by the reddish-orange slash of its extraordinary bill. From this perspective, it is essentially a white bird, terminated with a black arc of widely flourished tail feathers. Outrageously orange legs and webbed feet set off the astonishing moment. The puffin lands, stands, and looks around. It thrashes its wings at nothing in particular, calms down, and turns sideways. In an instant it transforms into the bird we all know and love; the sea parrot, the clown, the tammie norrie. The rock has a little step towards its seaward edge, a foot long, a few inches deep. The puffin subsides onto that step and folds itself in such a way that it perfectly fills the shape of the step, as if a loose part of the landscape had just been ushered back into place. Ten yards away, another puffin whirrs in on blurred wings, its bill full of fish. I say full, but in reality it isn’t. It is carrying three fish sideways, facing alternate sides. Three fish do not amount to a mouthful for a puffin – seven or eight do, always arranged head-to-tail alternately. The problem is that while puffins are perfectly capable of catching seven or eight fish at a time, the feat presumes that there are fish in abundance to catch. The fish of preference for puffins is the sandeel, and sandeel numbers are not what they once were. At least if they are, they are moving away from their traditional waters as far as the Scottish puffin population is concerned. The Scottish population is about 470,000 breeding pairs. This is 80% of the UK and Ireland population. The European population is about five million pairs, of which Norway and Iceland hold 80%. That sounds like a lot, but between 1986 and 2012, Fair Isle’s population halved from 20,000 to 10,000. According to Birdlife International, current estimates suggest that by the year 2065 Europe’s puffin population will have declined by between 50 and 79%. In the south and west of Iceland breeding has failed completely every year since 2005. Puffins are beset by an array of problems, and climate change appears to be at the root of most. Warming seas affect the quantities of prey species and their distribution, which affects what puffins can catch. In the absence of enough sandeels to sustain themselves and their chicks, the whole breeding cycle becomes vulnerable. What climate change does produce in ever-increasing quantities is extreme weather events. 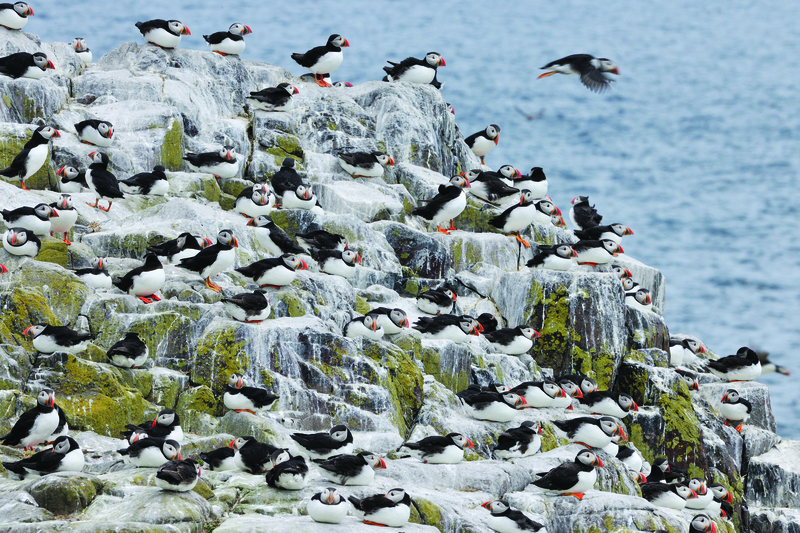 Winter storms out at sea, which is where puffins spend the winter, can produce devastation among seabird populations. 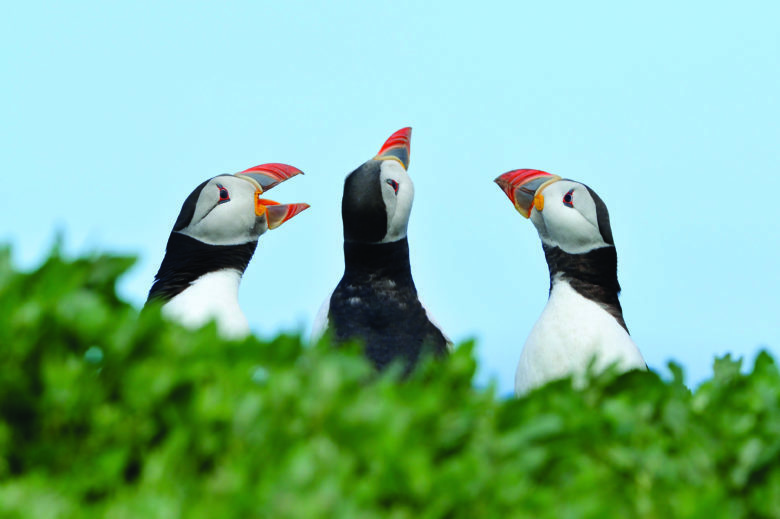 For reasons not yet fully understood, puffins are particularly vulnerable. “Puffin wrecks” are the end result. Leaving aside the unfortunate terminology, large numbers of puffin corpses turn up along our coasts. The worst was in March, 2013. Thousands washed ashore from Shetland to Northumberland, a grim reverse migration of the dead. Add to that the toll taken by oil spills and other pollution, and the vexed question of sandeel fisheries – about a million tonnes in the North Sea in the last decade. They conducted bird counts, and tagged 31 birds to study where – and how far – adult birds are travelling to fish. They asked for “citizen science” to help with information about diet. 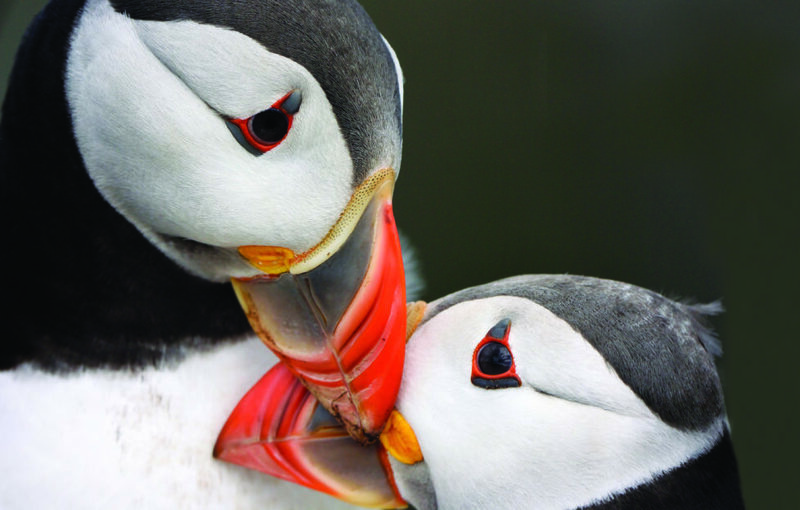 Bird watchers were asked to send photographs of puffins with fish in their bills to Project Puffin. But the reality is that unless we find ways – as a species – of moderating our lifestyles to such an extent that the process of global warming and its associated climate chaos begins to reverse, catastrophic seabird declines may well happen long before 2065. I confess I am something of a puffin junkie. I have watched them on the Isle of May, at Auchmithie on the Angus coast, in Orkney and Shetland and Fair Isle, in the Western Isles and most memorably in St Kilda. It was 1988; I had just given up my day job in order to write nature books. The first was a collaboration with photographer Colin Baxter on St Kilda. I camped there for two weeks, and late in the second week the sea was calm enough to land on the island of Dùn which throws a long, protective arm about Village Bay. Dun, from certain angles and in a certain light, looks like a hideously magnified bar of Toblerone, but with a continuous spine. It is up here, near the ridge, that you find the puffins, so rarely disturbed by humankind that they show little inclination to get out of your way. The rangers who accompanied our small party talked airily of a quarter of a million puffins; this on an island less than a mile long, nowhere more than a quarter of a mile wide. I had trouble believing them but a survey was done in 1999, and the suspiciously precise result was 284,528 puffins. It is not the kind of place you can survey often. I shudder to think how low that figure might be today. “St Kilda is this: it is a mad, imperfect God’s hoard of all the unnecessary lavish landscape luxuries he ever devised in his madness. These he has scattered at random in Atlantic isolation 100 miles from the corrupting influences of the mainland, 40 miles west of the westmost Western Isles. He has kept for himself only the best pieces, and woven around them a plot as evidence of his madness. First he has wreathed his hoard in mists to intrigue the corrupted world, then set the lure of inaccessibility to snare its curiosity. The encompassing seas are both defender and in their own good time exquisite destroyer of St Kilda, so that it submits stubbornly and gloriously like bracken in autumn. When the seas win over and St Kilda is smoothed into the floor of the ocean as sand, the world will mourn and learn by St Kilda’s example to cherish the wild places of the earth. I became enthralled by puffins on St Kilda. I met them often enough on Auchmithie beach and on some headlands of Skye, but on St Kilda they were clustered thick as pebbles. They growled their cheerful little growls outside their burrows high on that extraordinary rock, that improbable island walkway. They stopped to pass the time of day with this posse of tall creatures so blatantly ill-equipped for life in such a landscape. And I learned something of my first lesson in what it takes to survive in a wilderness. This was my first venture into the world of the nature writer. And it made my first commissioned book fizz in my brain. That thrush-sized bird endeared itself to me with its raw daring, by the courage nature demanded of it every moment of its life. I doubt if we were on Dun for more than a couple of hours, but they were two of the more durable hours of my life. Every puffin I have seen since harks me back and makes me smile. 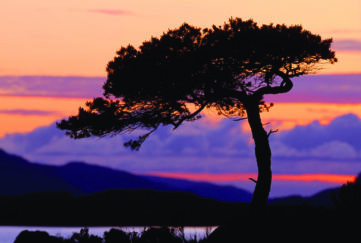 online here, and each month in The Scots Magazine.